We haven’t seen the Burrito Bison in years, but now he is back! In Burrito Bison 3 Launcha Libre Game, you have to launch him as far as you can to prevent the gummy people from taking over the world. How far can you launch Burrito Bison? 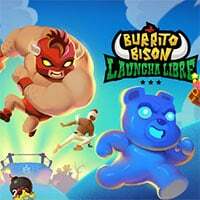 Enjoy and have fun in playing Burrito Bison 3 Launcha Libre Game. Good luck. This game is one of our action games at Round Games. This game is also tagged as a fun game. To play even more free games, view our most played and all games pages. If you want to play more games like this game: Then you can simply check out the games inside the game tags that are the most relevant to your interests or check the Action Games category or check the related games section at the end of the game page. Also make sure to check out Horrible Histories Gruesome Game-A-Thon Game, you may enjoy playing it.